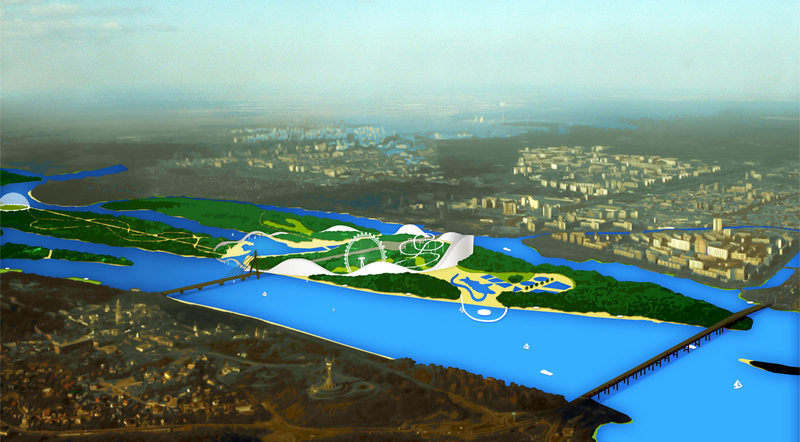 Kiev Islands on Dnieper River serve now and should serve in the further future as spaces of active recreation, leisure, flora and fauna exploration. The challenge is to develop the missing infrastructure in a sustainable and technologically advanced manner. 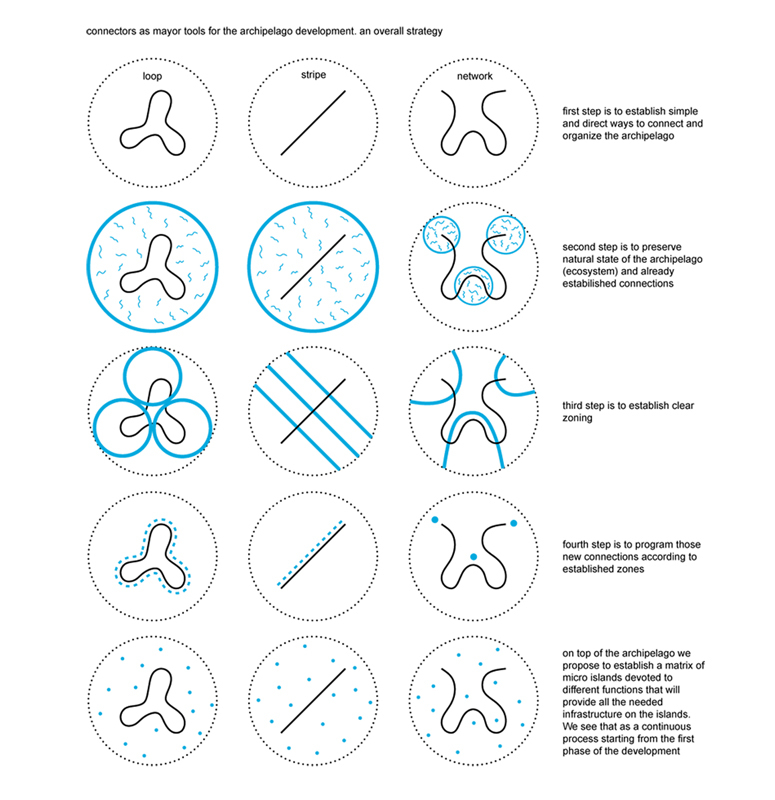 Character of our design responds to the ‘genius loci’ – in the wild area it is humble and almost invisible, but where the islands make visual connection to the city, our project gets an urban manner. 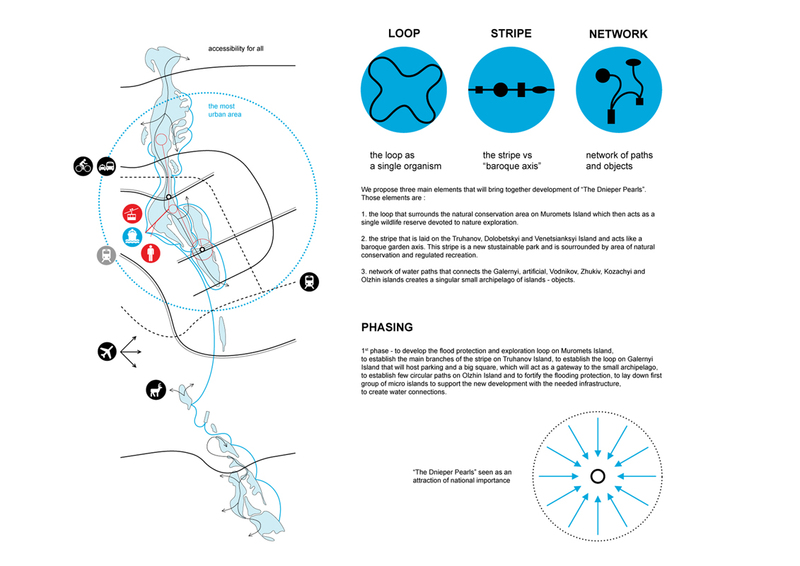 The areas of different nature preservation status were distinguished with implementation of loops, stripes, paths and objects – micro islands, that create networks. We propose three main elements that will bring together development of ‘the Dnieper Pearls’. 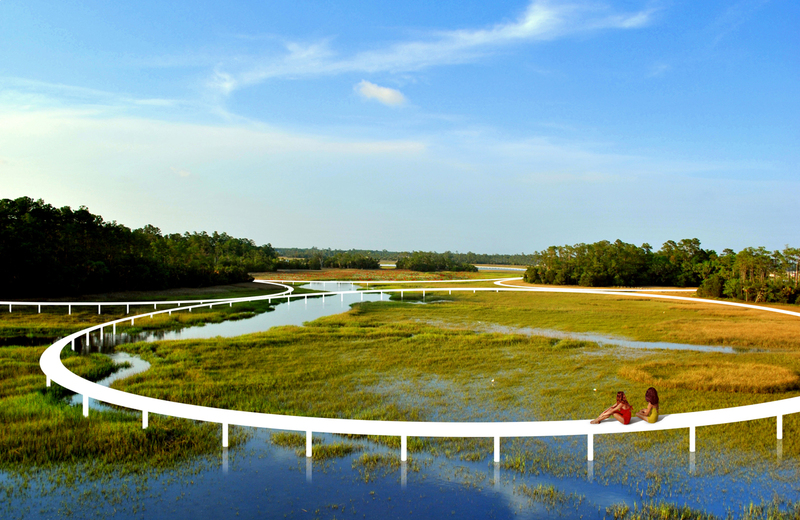 1. the loop that surrounds the natural conservation area on Muromets Island which then acts as a single wildlife reserve devoted to nature exploration. 2. the stripe that is laid on the Truhanov, Dolobetskyi and Venetsianskyi islands and acts like a baroque garden axis. 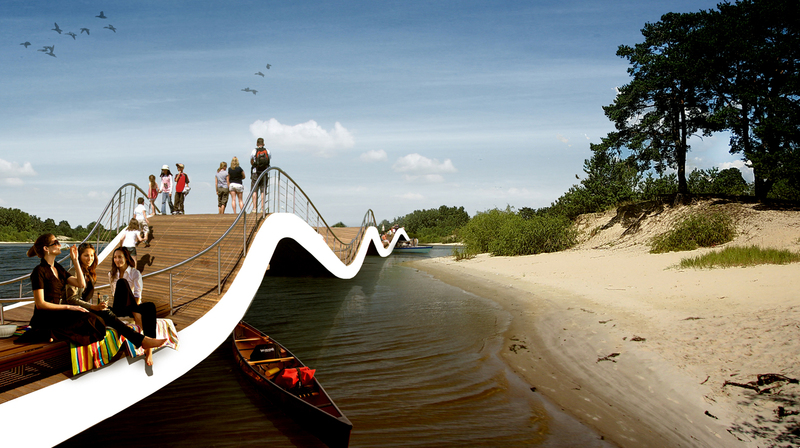 This strip is a new sustainable park, which is surrounded by areas of natural preservation and regulated recreation. 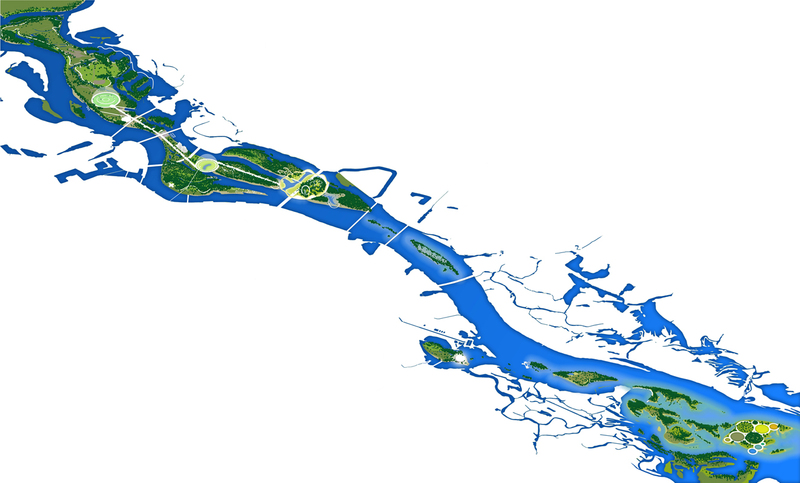 3. network of water paths connects the Galernyi, artificial, Vodnikov, Zhukiv, Kozachyi and Olzhin islands and therefore creates a singular small archipelago of islands-objects. 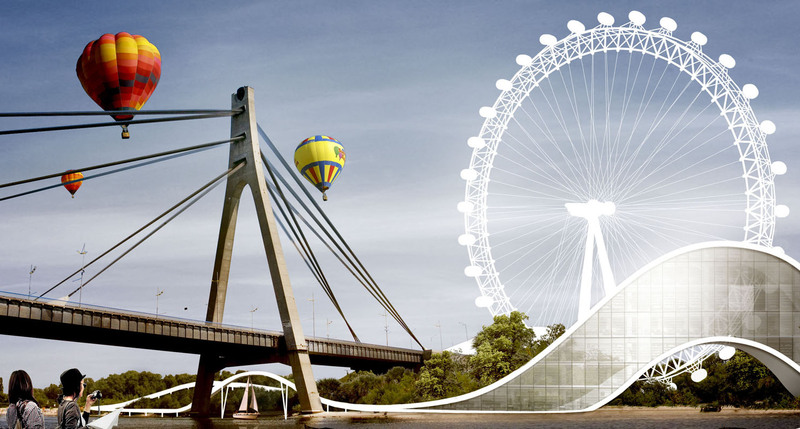 The complexity of our masterplan requires its phasing. First step is to establish simple and direct ways to connect and organize the archipelago. Second step is to preserve natural state of the archipelago (its ecosystem) and connections that were established before. Third step is to establish clear zoning. Fourth step is to program those new connections according to newly established zones. 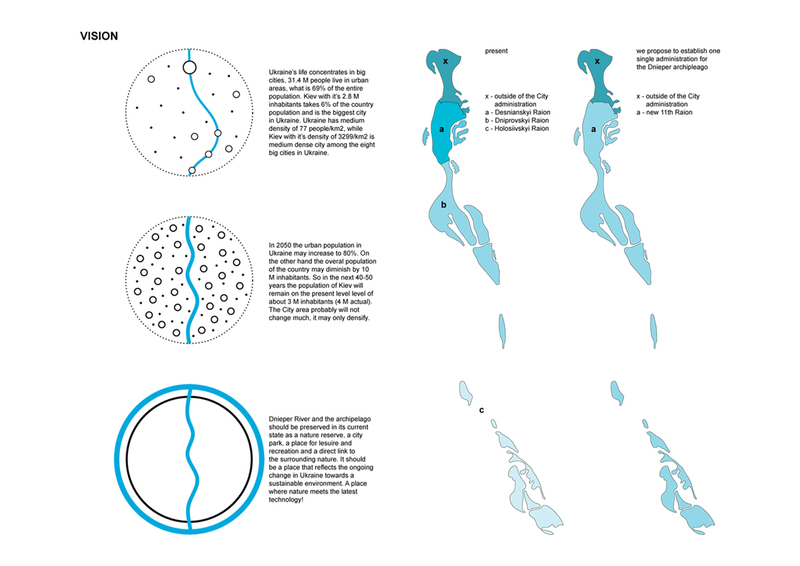 Then, on top layer of the archipelago we propose to establish a matrix of micro islands devoted to different functions that will provide all the needed infrastructure on the islands. We see that as a continuous process starting from the first phase of the development. The “new” implementations on Kiev Islands should lead us, in the next 40-50 years, to the situation of these islands being space of national importance. Kiev Islands should become a complex landscape, where the latest technology meets the magnificent scenery of perfectly preserved natural landscape with crystal clear water and vast variety of protected plants and species. On other hand it should be place where you can simply have fun !